Happy May Day! The first day of May was always a major event in the USSR and other Communist countries, as it commemorated efforts to improve the rights of workers. Sixty years ago, in the summer of 1954, the Girl Scouts found themselves embroiled in their own Red Scare. The problem started with a new edition of the Intermediate Handbook, released in 1953. Robert LeFevre, a Florida-based television personality, took it upon himself to compare the 1953 edition with the 1940 Handbook. He condemned the revised handbook as UN propaganda promoting socialized medicine, agriculture experiments, prejudice, and other harmful, anti-US values. LeFevre published his criticism, “Even the Girl Scouts,” in the March 31, 1954, issue of his newspaper, Human Events, and sent copies to many media outlets. Most ignored it, but a few reprinted his piece. But, in a case of very bad timing, GSUSA was then in the process of revising the Intermediate handbook before its next (5th) printing. 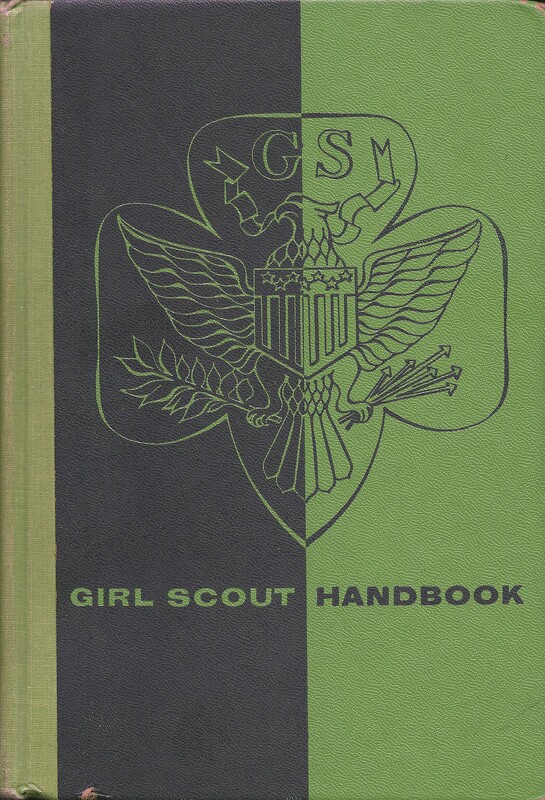 Based on reader responses, editors planned to better distinguish between the United Nations and the World Association of Girl Guides and Girl Scouts and to include the full text of key citizenship documents, such as the Bill of Rights, instead of just excerpts. Rather than sending a list of minor changes to the printer, GSUSA compiled a 12-page pamphlet detailing the corrections to be made. 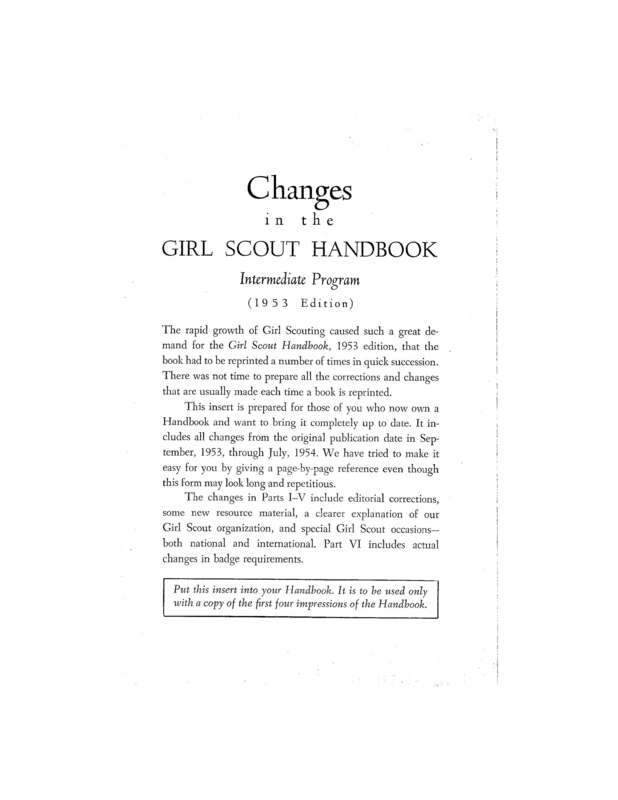 Pamphlet with revisions to 1953 Intermediate Handbook. LeFevre pounced on this pamphlet and took full credit for triggering the revisions. To some observers, the changes suggested that LeFevre was right — the Girl Scouts had been exposed as trying to undermine the US government. GSUSA moved to dampen the criticism and emphasized that the revisions were well underway before LeFevre attacked the organization. Most important, as GSUSA President Olivia Layton wrote in a memo to council presidents dated August 26, 1954, the changes “were made to clear up misunderstandings and do not represent any change in the basic beliefs of the organization — there never has been anything un-American in the Handbook. Unfortunately, the attacks on the Girl Scouts only grew worse, as Congress entered the debate. This entry was posted in Program, Sensitive Issues, WAGGGS and tagged communism, controversies, Girl Scout history, Girl Scouts, GSUSA, Intermediate Handbook, Red Scare, Robert LeFevre, un-Americanism. Bookmark the permalink. I love your book and your blog. Could you check the LeFevre link, “Even the Girl Scouts,” please? It goes back to the Dress Like Juliette Low blog post. Thanks! I think it’s fixed. Thank you for letting me know!